2011??? How did this happen? I look at the number and it doesn’t look real to me. I guess that is what happens when half of your life has been lived in the 20th century. I have never really liked New Years all that much. My birthday is one month later. To me New Years is really all about getting older. Plus I usually get a cold or the flu at that time of year. Every photo taken of me when I was a child on my birthday shows me sick in bed with a pointy birthday hat blowing out the candles. Normally on New Years Eve we spend the evening with friends but this year it is just the two of us. Which is fine really. We have dinner reservations at a nice restaurant and then we’ll come home and watch the Twilight Zone marathon. That has been the highlight of New Years weekend for us for quite a few years now. We love those old episodes no matter how many times we see them. Rod Serling was quite a genius. Too bad he smoked like a chimney and died so young. In one month we head out to Tucson for a glorious week communing with the desert. I cannot wait to get back there. We decided not to go for the Gem Show this year. I didn’t really spend that much time at it last year. All I wanted to do was to be outdoors. Hiking in the desert. Taking pictures. Plus it is so crowded that week. The restaurants are full to overflowing and it is nearly impossible to get into the really good places. So this year we are going the week after the Gem Show. We are staying at the same resort we stayed at last year, The Westward Look. It is a lovely place and one of the only ones without a golf course. Neither of us is really into the whole golfing mentality. They have lovely grounds and they even have a kitchen garden that the chef uses to pick food for his menu. Talk about farm to table freshness! We have friends who spend the winter in Tucson and they keep us very busy seeing new things. This year they tell us we are going to go to see Mount Lemmon. We didn’t go last year because I was NOT interested in seeing snow. I am still not interested in seeing snow, but they insist we must see the mountain up close, so I guess we will. Of course Sabino Canyon is on the itinerary again as well as Saguaro National Park. That place blew me away last year. The quiet was so intense. You could hear the cactus breathe. For now I will try and be patient and be in the now. Even if it is freezing and my boots leak. 2 trees, originally uploaded by Roberta Warshaw. It is very hard being a Jew this time of the year. You don’t celebrate Christmas. You try to conform. You bring in food for the holiday party. You bring in a gift for the Yankee swap. You try and put up with the Christmas carols in the stores while you are food shopping. Even the blogosphere is all Christmas, all the time. Everybody getting ready, getting ready. But you aren’t getting ready for anything. Well actually you are getting ready for it to be over so that normal life can resume. I still remember when I was a child, all the things I did to try and celebrate Christmas. Once after Christmas was over and trees were being discarded, I went around my neighborhood and removed the leftover tinsel from the trees and brought it home. I made my little brother stand in the corner while I decorated him with the found tinsel. I was that desperate. Another time, I found a red bow in the trash, attached it to a pine bough from a tree in my yard and hung it on the front door. I thought my mother would die of a heart attack. She ripped it down and said we don’t celebrate Christmas. End of story! So needless to say, when I got married the first time, my husband was not Jewish. Christmas was a big deal for his family. Of course I too went nuts. I made ornaments from felt and wood. I made gifts and decorated the house and the tree. And every year as the kids got older, the tree got bigger. The gifts were no longer hand made. There were nintendos, toaster ovens, computers, electronic games, and boxes and paper everywhere. When we lived in Florida, Christmas was especially hard because every year my very Jewish parents would come to visit to get out of the cold. They made sure to tell us that there were to be no signs of Christmas anywhere in the house or they wouldn’t come over. So the day after Christmas we would scramble to take everything down. It wasn’t easy! But we managed. Although one year I seem to remember seeing a stray piece of tinsel in the corner of the living room and hoping they wouldn’t notice. So now, my adult children are used to Christmas. My daughter has a tree and decorates her house with all manner of Santas, nativities, and pine boughs both real and fake. We still have a nice family dinner with turkey and all the fixings at my house. My parents come. We can’t call it Christmas dinner though so we call it Second Thanksgiving. Single leaf x two, originally uploaded by Roberta Warshaw. I have had a few inquiries regarding the image on my blog yesterday of the spider plant. I will tell you a little about how I made it. The other day I stumbled upon a scannography web site with some incredible imagery. Much to my delight, it was all done using a scanner. Now, as a graphic designer, I have a wonderful scanner. But I have only ever used it for scanning photos. And now that nearly all the photos are digital and no longer need scanning, my scanner has been collecting dust in the corner. I have always known that you can place objects on the scanner but I never had much luck with that. I tried putting my jewelry on it but metal looks really terrible on a scanner. Too many reflections. 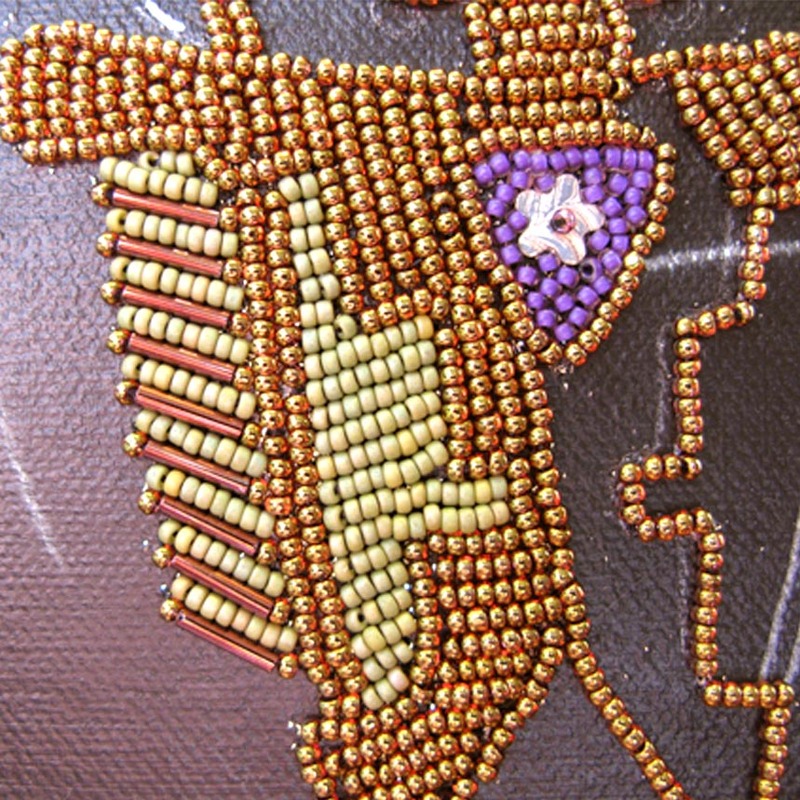 You can see that in the bead work I have tried to scan. The colorful beads look fine but anything with any metallic sheen looks awful. What I learned was that if you turn off all the lights in the studio and leave the cover of the scanner off, you can lay things on the scanner and get some really interesting effects. So I went all over the house, stealing leaves, both dead and alive from some of my houseplants. I got some interesting effects. On this one, I scanned in a leaf and then in Photoshop, duplicated the layer, flipped it and set it to multiply. Voila. You can create many interesting effects this way. Some people even take the scanner outdoors and use the sky as a background instead of the darkness of a room. I think this has endless possibilities and am looking forward to trying other things with it. Is it cheating? I guess so. But I take imagery where I can find it. Especially when it is too cold to go out with my camera. BJPJanuary2011, originally uploaded by Roberta Warshaw. So right off some mistakes were made here. The main mistake was that I cut the Lacy's to size and it became very hard to work right up to the edge. I had purchased a few pieces of Ultrasuede so I glued and basted the piece to the Ultrasuede. I love the color of the Ultrasuede. it is very rich and luscious. Plus now I can get a grip and am able to bead up to the edges. I still haven't figured out the best way to edge this. I'll have to wait until the beads are all in place and then see what I want to do with the border. I don't want the white of the Lacy's to show. I am thinking that this might make a nice bag or something. Not quite sure yet since I am so inexperienced and don't know exactly where this will lead. woodpecker, originally uploaded by Roberta Warshaw. It has been so cold here for the last week. To me anything under 38 is too cold. But it has been in the 20's relentlessly. I am happy that I can help my little bird friends out. I just recently realized that I have two different woodpeckers coming to my feeder. There is this one in the photo and a red headed one as well. They are the sweetest birds. Always waiting patiently for their turn at the feeder. The funniest thing about them is that they cannot seem to get a grip on the iron railing. So while they are waiting for their turn at the suet, they slowly slide down, down, down......it is quite funny really. When I arrived home from work today and turned on the news, I was greeted with the news that Elizabeth Edwards had died. Immediately my eyes filled with tears. I wasn't expecting them. After all, I did not know her personally. She wasn't family. And yet, I felt so deeply saddened and humbled by her death. Sometimes things just hit us in ways we don't expect. She suffered so much pain in her life. Not everyone gets hit like that. One thing after the other. First her teenage son died. Then her stage 3 breast cancer diagnosis. And finally, being left alone to deal with all this pain by a cheating spouse. How much can one person take? If it were me, I don't know that I would have ever gotten past the first tragedy. The death of a child. How does one go on from that? But she did. And with grace. She was a fighter to the end and a real role model for all women today, young and old. We lost an important person today. 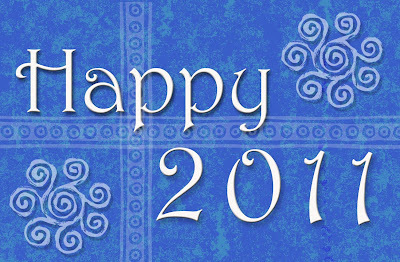 BJP2011 Jan beginnings, originally uploaded by Roberta Warshaw. After wracking my brain the past few weeks, I have finally decided on a size and theme for my Bead Journal Project for 2011. The size will be 3 inches by 3 inches with rounded corners. I got the idea from Dee. Her work is sublime and I hope she doesn't mind that I borrowed a few techniques from her. The first being the size and the rounded corners and the second is using more seed stitches as opposed to back stitch. I love the way she uses the seed stitch to fill in the backgrounds of her designs. 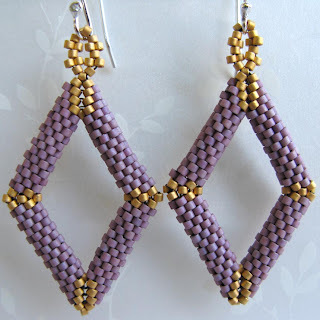 You can really tuck those little delicas in in a way the rounder seed beads cannot be. Of course, Dee's way with color and blending cannot be matched, but she has inspired me so much! For a theme I thought I would just try and use metal clay in each piece. I love making small metal clay components. Usually when I get enough different sizes and shapes, I can then begin to play with the pieces in a variety of different designs. cute sparrow, originally uploaded by Roberta Warshaw. The bird feeder was incredibly busy today. Whenever we put out suet, look out! We had two different woodpeckers and even a starling! This little guy was the most photogenic though. Just look at that face! Even the big bad blue jay paid us a visit but I didn't get a shot of him. Maybe next weekend. birds at my feeder, originally uploaded by Roberta Warshaw. In winter, I could sit in my bedroom and watch the birds at my feeder all day long. As if I don't have anything else to do. Living in the city, I mainly get sparrows. Tons of them. Occasionally I get a rambunctious blue jay, the occasional chickadee and when the snow flies, if I am lucky, I get a cardinal. Oh and woodpeckers on the suet. When I lived out in the country I had nuthatches, grosbeaks, evening grosbeaks, and wild canaries. But now I must be satisfied with sparrows. In fact, they are not so bad. Kind of cute. Very curious and not at all shy. Beech Tree, originally uploaded by Roberta Warshaw. I took this unusual shot today on the Longwood Mall. The mall is a small park near my house, with really old beech trees. They were planted in the mid 1800's and miraculously still stand today. Thankfully, they are protected so no developers can cut them down in order to build more condos. After I took the photo I realized it looked like an eye with stitches down the cheek. Part two of the "tagging" was to choose 25 of your FaceBook friends including the original person who tagged you, and send your list to them. 1. I will turn 61 in February. 2. I am an old hippie flower child from the 70's. 3. I lived in a tipi once. 4. I lived in Hawaii once. 5. I lived in Ibiza once. 6. I lived in Key West a lot. 7. I have two adult children in their 30's. 8. I have an 11 year old grandson. 9. I am an artist who spent over 30 years exploring gouache, oils and watercolors. 10. I have been married twice. 12. I camped out for an entire summer in the Rocky Mountains once living in a small tent. 13. I was arrested once for hitchhiking. 14. My second child was home birthed. 15. I once lived for 3 years with no electricity or running water or indoor plumbing. 16. I never turn the lights off now. 17. I need to be creating all the time. I am addicted to making stuff. 18. I hate clothes shopping but am addicted to book shopping. 19. I have had many lovely gardens in my life. Both vegetable and tropical fruit. 20. I miss my gardens very much. Especially my banana and papaya trees. 21. I always wonder if I could have been a better parent. 22. I am a fantastic grandparent. 23. Both of my parents are still alive and I am grateful we have had so much time together. 24. I regret the way I treated them when I was younger. 25. I am glad they still love me anyway. full moon over Brookline, originally uploaded by Roberta Warshaw. I want to wish everyone a wonderful Thanksgiving Holiday! I thought I would post this. I started it before I became ill last week, and I have been staring at it for over a week now. I know what needs to be done but of course I am reluctant to do it after all that work. But it will only get worse so I may as well just do it. Today is as good a day as any since It will be pretty mindless, repetitive work. The problem is the green beads. They are just too close in value to the pink luster beads on the figure. There is not enough contrast. It may be hard to tell in the photo as I am so bad with capturing the proper light in my photos, but trust me it is not working. Especially when I set it next to my other two figures. They are full of interesting contrasts. You may have noticed that I haven't posted anything in a few days. I have been nearly at death's door with a severe case of food poisoning. I never had food poisoning before. Not like this. Sure I've had the occasional upset stomach from a bad meal but this was different. This I could see, might have killed me. It got to me to thinking how quickly we can go from the perfect picture of health one day, to near death the next. I spent all day Saturday in the ER. They were so wonderful to me there. They put warm blankets on me and loaded me up with IV fluids so I wouldn't dehydrate. At one point they even gave me some morphine for the pain and cramping. Today (3 days later) I am finally up out of bed and beginning to feel human again. One of the nurses said that I would be weak as a kitten and she wasn't kidding. I didn't even have the strength to lift a magazine or a newspaper. I couldn't even concentrate. This whole thing has made me realize that just because I live across the street from so many restaurants, I need to get back into cooking more. It is so easy when I get home from work too tired to cook, to just order in. Chinese, Indian, Vietnamese, you name it, we have it in our neighborhood. I have so many cookbooks but I always think that there is a restaurant nearby who can make it better than me. Maybe not. I like this Lacy's stiff stuff. I can see myself making small components like this and appliqueing them to a larger piece. The one thing I don't like is all the tiny hairs that come off while working, The canvas doesn't do that. I like the smooth surface of the canvas better. But I am trying a variety of techniques, in the hopes of improving every day. 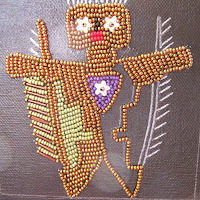 Today someone posted on my Facebook page how my new bead embroidery designs remind them of my hand painted T shirts of long ago. And yes they do. 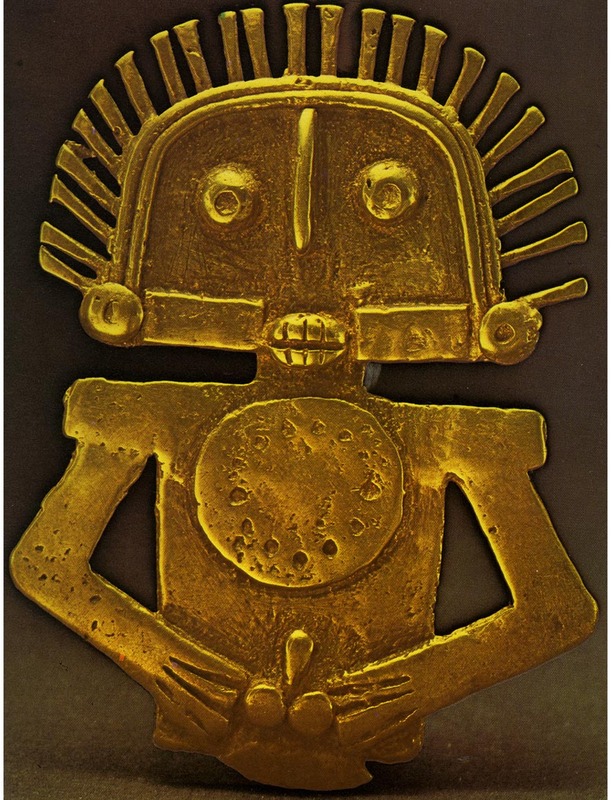 I have always been inspired by Pre-Columbian artifacts and they seem to come out in my work in a variety of ways! Ms Tolima, originally uploaded by Roberta Warshaw. I wasn't sure if I was going to finish this but as it turns out I am glad I did. I think she is interesting and at the very least I am getting better with my beadwork and my stitches. I like the way her central area came out. In the original it is just a circle. But to me it seemed like as many times as her heart has been broken there is always room for a new flower to take root there. Tolima man, originally uploaded by Roberta Warshaw. I am getting there. I want to add some embellishments. Tomorrow I am going to make some metal clay decorations to use. 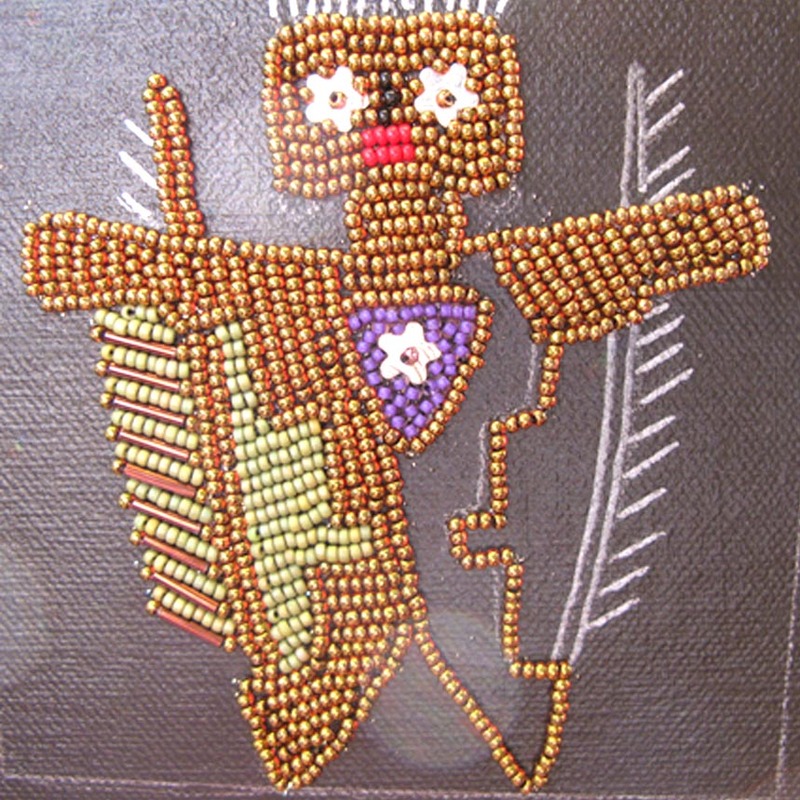 Close up of bead embroidery project, originally uploaded by Roberta Warshaw. I don’t know where I am going with this yet, I just know it is something I need to explore. I recently discovered a wonderful book by Robin Atkins. 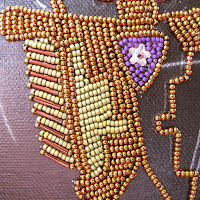 It is about exploring meaning in your life through the use of embroidering with beads. Many years ago, when I was a hippie living in a teepee in upstate New York, I began my artistic explorations with embroidery. I would sit for hours at a time and embroider denim jackets, blue jeans etc. I did it for my friends and family, mostly for free. No one charged for things in those days. We were such free spirits. It was my first foray into being an artist. I was all of 22 years old. banana trees, as well as still lifes of mangoes and papayas and other luscious tropical fruit. In the mid 90’s I moved to Boston and stopped painting. I had to get a day job and the both the daylight and my energy were all used up by the time I got home at the end of each day. I still very much needed a creative outlet and so I began to learn jewelry making. I do enjoy it very much but lately I am feeling the need to go back to my roots in the art and painting world. I thought I would try this new medium of beads as paint. This is my first foray into beads as a painting medium. I have no idea what it will look like but for now it is about getting my creativity flowing as well as my stitch work perfected. Embroidering with beads is quite different than embroidering with thread. 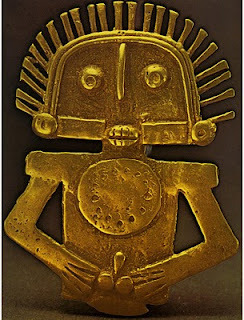 I love these bronze Tohos...., originally uploaded by Roberta Warshaw. I am a little confused and dismayed and I hope that some folks out there can clear things up for me. It has to do with copyrights on a jewelry technique. Over the years I have taken a variety of metals techniques courses. There was fold forming with Cynthia Eid, weaving with wire with Munya Upin, Forging with Cynthia Eid, making texture plates with Michela Verani, Anticlastic raising with Michael Good and many others as well. Never in all of my classes has anyone ever said that I could not use these techniques to create and sell my own line of jewelry. So it came as a great shock to me when I picked up the most recent copy of Beadwork magazine with an article by Marlene Blessing dealing with copyright designs in beadwork. Kathi Khaladkar designed a necklace using shaped peyote triangles. 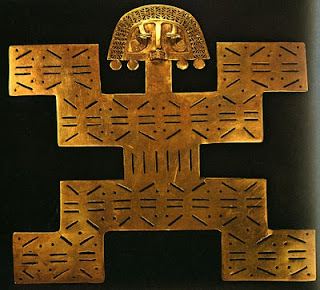 Apparently she had to ask for and get permission from the designer of the triangles to use them in her necklace design. My question is: why, if the necklace was her own design did she need permission to use these elements? Why are beading techniques any different than regular metalsmithing techniques? Why are they proprietary? When I pick up a beading magazine, many of the designs look like other designs I have seen. 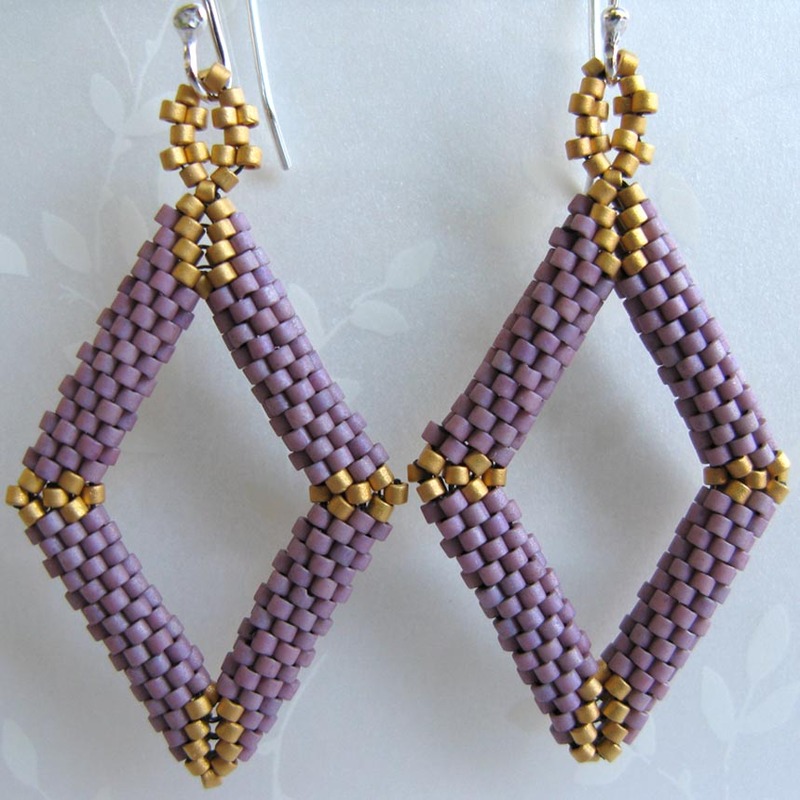 But through the skillful use of color and perhaps different beads, the designer has made it his or her own. 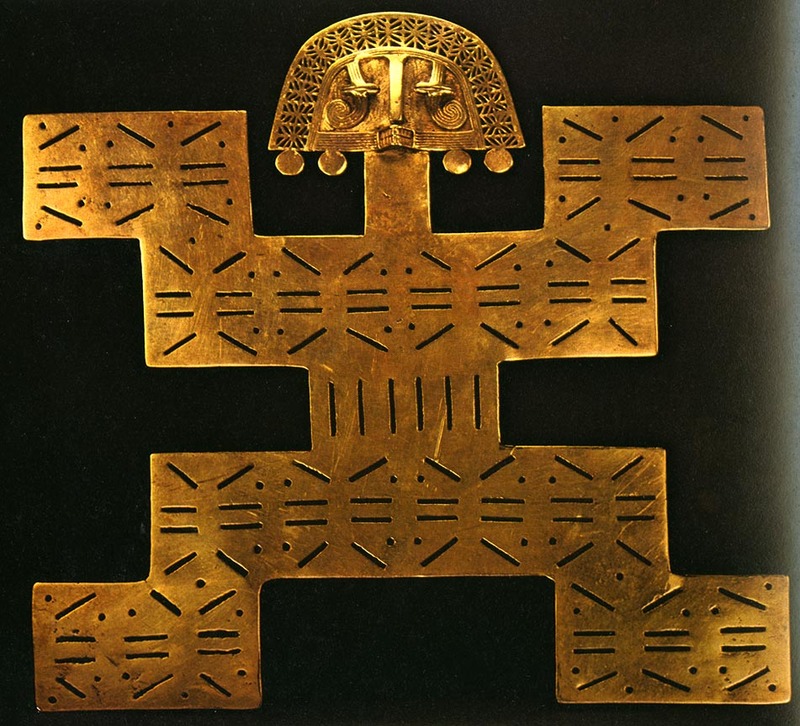 In fact, with the triangles the designer asked permission from Phyliss Dintenfass whereas I got my instruction for the very same triangles from Diane Fitzgerald’s book Shaped Peyote”? Does someone really own the copyright to this peyote shape? Right now I am in the midst of designing a necklace using a variety of these shapes. The necklace is my own design incorporating the shapes. If I wanted to sell this, then is it possible I cannot sell it when finished? What is the point then of learning techniques if I cannot utilize them and sell my designs. I would never copy someone else’s design for a piece of jewelry on purpose. So where are the boundaries on this? Why is it only in beading? Am I missing something? Do I need to contact the book author for permission to use these shapes in my work? I had a lovely class this weekend with Michela Verani at Metalwerx. It was a very small class. There were only three of us so it was more like a private lesson. Michela is a wonderful teacher and very approachable. I like that in a teacher. Very often you don’t get that. But you could ask her anything and she shared her knowledge freely and easily. The class was about making your own textures for Metal Clay. It was an eye opener for me in many ways. I finally got to see what was meant by “tear aways” and also PPP (Photo Polymer Plates). I liked both of those processes but I am not sure I will use them. They are quite complicated and require the use of a specific type of laser copier that may well be going out of production at some point. That coupled with the fact that the type of Sculpey you are supposed to use (the one with phalates) will be going out of production in December, makes the process less inviting to me. What I did like was making a texture in polymer clay and then baking it. That is fairly lo-tech and now that I know I can use my oven to bake the clay, I will try it. I was always told not to use the oven but if you use plastic baking bags and contain your piece in that, no plastic polymers get into your air or your oven. So I will try that. Also, I very much enjoyed the embossed paper technique. This was my favorite of all the techniques. Since I have an extensive background in painting and drawing, I can make my own art and get a nice tight design this way. I have quite a bit of left over water color paper from my years of painting that I can use for this purpose. I hope to post some photos soon! 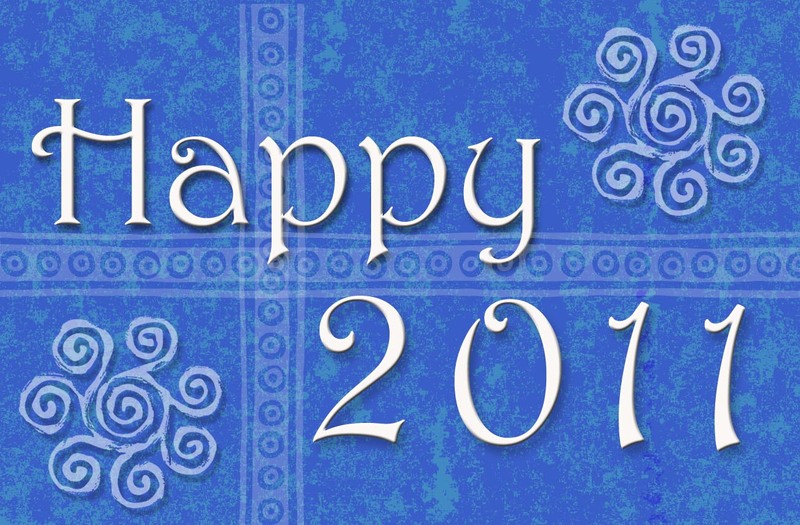 Yesterday was Rosh Hashonah, the Jewish New Year. I always feel guilty because I don't belong to a temple, therefore I don't go to one on the holidays or any other time. (Unless of course I am invited to a Bar or Bat Mitzvah.). I live in a town where everyone goes to Temple on the high holidays. There is at least one temple per block here, so there is no excuse not to go really. So to make up for not going, I cook. I figure if I don't go to pray to God I might do just as well cooking for him (or her). So I spent the entire day on my feet in the kitchen. I made potato kugel from scratch just the way my grandmother made it except she grated her potatoes by hand, and I use the food processor. The food processor makes really quick work of 8 Idaho potatoes! Then I made the matzoh balls for the chicken soup. Lucky for me you can buy a mix for them because otherwise I would have no idea how to make them. They were delish. I made two roast chickens as well. The rest I bought. Rugalah and challah from Kupels, and wine from Trader Joes. I had invited our good friends, the Katz's over for dinner and we had a lovely evening even though they never miss an opportunity to let me know how they feel about Barney Frank. I adore the Katz's but they are staunch Republicans. I can never agree with them on political issues, nor they me. But we love each other anyway. By the end of the night I didn't feel guilty at all about not having gone to shul. My feet were too sore from being on them all day in the kitchen and I was too tired to care. I have been off all week from the day job and it has been simply spectacular. The weather was perfect. I rode my bike every morning and beaded on the balcony every afternoon. (Of course only when I could get the chair away from my cat!) Sherpa always tries to beat me to it but sometimes when she gets up I can sneak in. Anytime I thought "Oh, I should go clean' Or I should do this or that...." I said NO! You are on vacation and you must listen to the muse. THE MUSE says go forth and create something beautiful. So without further ado, here are some things I made while on my week long break from the routines of life. Blue Spruce or Memory Tree, originally uploaded by Roberta Warshaw. The first time I saw this blue spruce at the Arboretum, it made me cry. I know that is pretty ridiculous right? The tears just came out of nowhere. I was riding my bike in the peace and tranquility that is the Arboretum. Enjoying all the huge trees and the healing sense they give me. Then suddenly I saw this one and the sweet memory of my grandmother came rushing in. I spent a large part of my childhood at my grandmother's house in Newton. In those days, everyone seemed to have a grandparent living in Newton! My grandmother (or Nana as I called her) had a tree in her yard very much like this one. Not as large of course. This one is much older than my grandmothers tree was. But you just don’t see trees like this anymore. Sadly, many of them have been cut down to make room for yet another overly large house and the ubiquitous lawns that seem to go with them. Since this one is protected at the Arboretum, it still stands proudly. My grandmother adored me and I her. She never stopped spoiling me. My mother, being rather strict, would never let me eat candy or stay up late to watch horror movies. But Nana would take me to the A&P (where Whole Foods is now) and buy these giant over-sized Hershey bars for us to snack on. We would crawl into her bed late at night and watch Frankenstein or the Mummy until the wee hours eating candy. Or we would go out for ice cream to Brighams and get ice cream cones with jimmies on them. (Sprinkles for those of you not from Boston). Often she would take me to Woolworths (yes a store from a bygone era) and buy me toys. I still remember a doll called Betsy Wetsy. I know I am really showing my age on that one. Betsy Wetsy was of course just what she sounds like. She came with a bottle and two holes. One in her mouth and the other...... well, you know where. Very often I would rummage through Nana’s drawers and play dress up. She had lovely silk scarves that I would wrap myself up in like a sari. There were gorgeous hand beaded bags which I still have tucked away. I really should display them. Of course there was the jewelry. I really think my love of jewelry began in those drawers. Most of it was costume jewelry. My grandmother was a big woman and wore big jewelry. Much larger than I would ever wear now. But in those days I was small and the bigger the jewelry, the better! Funny how seeing one tree conjured up all these memories of my grandmother. I miss her every day. There is a bit of a storm brewing on Etsy ever since they redesigned the shop layout page. I really like it but not everyone is of the same mind. With the wider page and the larger photos, the look is much cleaner and the images really pop off the page. You had better have good photos now because there is no hiding from them! Also, the banners are an issue. I had to re-design mine on the fly when I realized it was too busy for the new look. I tweaked it until it looked right to me. I ended up making the background white and just tracking the type a bit to fill the space. I also changed the locations of my little decorative icons. I think it looks much better now. We had a mixed bag of a weekend. Friday we went out to Springfield to the Mineral and Fossil show. Friday traffic was really horrendous and I just wanted to turn around and go home. But of course on the Mass Pike there is no turning around. You are stuck there, with the windows rolled up, so as not to breathe in all the exhaust fumes for what seems like an eternity. The time spent sitting there can never be recovered. By the time we got to the exposition center it was way past lunch time and of course the food stand was a scary mix of hot dogs and hamburgers. Foods I just will not eat unless I am stranded in the desert with nothing...and even then I would have to be at deaths door. Anyway, they had warm pretzels so I got one of those. It was so salty. Blech. I scraped off what I could and ate it. After walking up and down the aisles, I didn’t see anything that excited me too much. After all, once you have been to Tucson anything else pales in comparison. I did meet a wonderful paleontologist with some incredible fossils. He had real dinosaur eggs! As I held one in my hand it occurred to me that I was holding in my hand something hundreds of millions of years old. Pretty impressive. I bought a trilobite fossil for my grandson. He was quite happy to add it to his collection of rocks and other assorted interesting ephemera. My husband bought a few things. 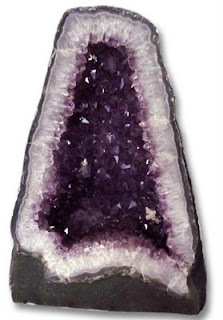 Ever since I took him to Tucson last winter, he has discovered that he likes geodes and minerals that have been carved or shaped in some way. So he has started a small but interesting collection which I will photograph and post at some point soon. After the show we drove up to Northampton where I paid a visit to WEBS bead store. They have a wonderful selection of delicas and tohos. I was in bead heaven in there and somehow managed to spend over $100. The only problem was that I forgot my Myuki durability list and so I bought a few beads that have color fading issues. I am going to have to spray those with Krylon before I use them. By then we were in serious need of a sit down so we headed for the local coffee shop where we had a much needed iced coffee. Afterwards it was on to the Raven bookstore. “The Raven” is a fantastic used book store in Northampton. If you are ever in the area do make it a point to stop in. They have so many books! I always find something. I found a wonderful book on Indian textiles and a book on magic tricks for my magician grandson. After a lovely vegetarian dinner at Paul and Elizabth's we headed home. I kind of wish we would have planned to stay overnight in Northampton. It would have made the trip more relaxing. Oh well. Next time. RAW first piece, originally uploaded by Roberta Warshaw. 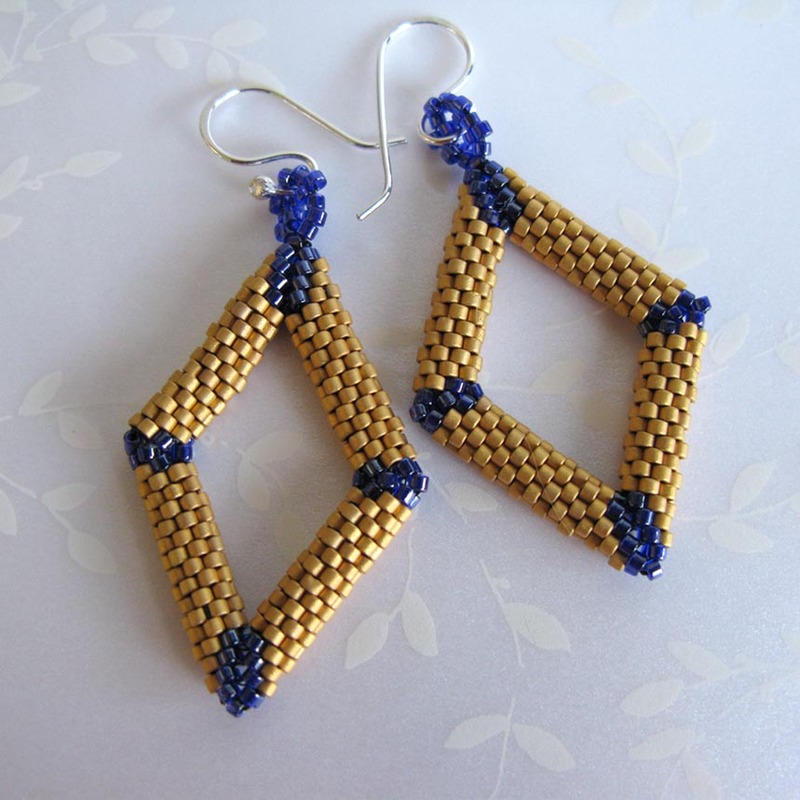 One thing that has really astounded me since I began adding beadwork to my repertoire is the number of wonderful bead designers that are out there! I really had no idea there was so much innovative work being done. Not to mention the unbelievable number of stitches there are to learn. I love how all the stitches look so very different and at how they effect the final design of the piece. 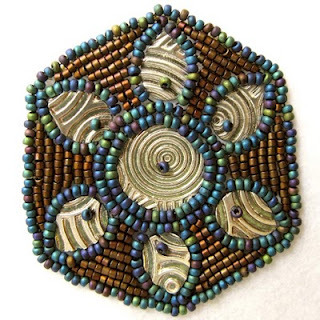 I recently discovered this beader, Nancy Cain. Here work is so perfect and beautiful. It is wonderful to have so many inspiring pieces to look at. One other thing I have found is that within the beading community are some of the most helpful people I have ever met. If I ever have any questions, there are usually many people I can turn to who will have the answer. 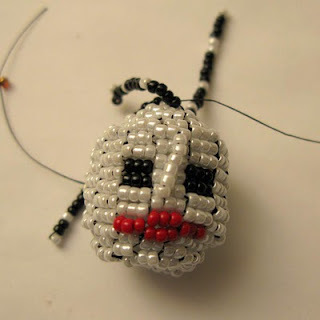 I have compiled a list of some of my favorite bead links here. This is my first piece of right angle weave. I took multiple tubes of a variety of metallic beads and just dumped them into a bowl. I was afraid if I did it all in one color I would get bored. I am hoping to add some metal clay embellishments to this when I am done. I like the right angle weave a lot and hope to improve my skills with this stitch very soon. It seems like a stitch which can be personalized more than some of the other stitches. One of my favorite places to go in the Berkshires is the Norman Rockwell museum. Not the actual museum, but the grounds. They usually always have some interesting sculpture. This photo was taken a couple of years ago. The exhibit was called “Garden Gates”. It was just lovely and this one is one of my favorite pieces from the show. Both this year and last year they did not have an outdoor exhibit and so I was a bit disappointed. I do hope that they don't stop having them because the grounds truly are lovely and it would be a shame to stop. On another note, I made our reservations for Tucson this winter. We are staying at the "Westward Look" again. We really loved that place since it is one of the only resorts that does not have a golf course. We don't golf and I actually do not like golf courses. I am visually offended by them. All that land, wasted on grass,fertilizer, and water. So at least I have something wonderful to look forward to this winter in the midst of all the horrible cold. One of the things I have learned thanks to the wonderful and oh-so-helpful beader, Lidia Cimins, is that some of the Delica beads have finishes on them that do not hold up under certain conditions. This concerns me since I want my jewelry and anything I make out of them to have durability. I have heard that some people spray their beads with Krylon first and that this protects the finish. However, I am not sure that I want to be using that stuff. It is pretty smelly and toxic and I try to keep a green studio as much as I can. So over the past few days I have been compiling a chart to help me see at a glance which colors are durable and which are not. Lidia directed me to a chart online called miyukidurability. Being a very visual person however, this only partly helped me. So I went to Fox Den beads and took screen shots of the colors. I matched them up with their durability list and created a pdf that I hope will help me when I am placing orders online for beads. More triangles, originally uploaded by Roberta Warshaw. I cannot stop making these triangles. Weaving them is the most relaxing, fun thing I have found in a long time. Most jewelry making steps stress me out. Especially things like soldering or enameling. Metal Clay is the most stressful of all. Will the clay dry out too soon? Will I be able to sell things I make with it, thus insuring I can buy more metal clay. Don't get me wrong. I love metal clay. I won't stop working in it. 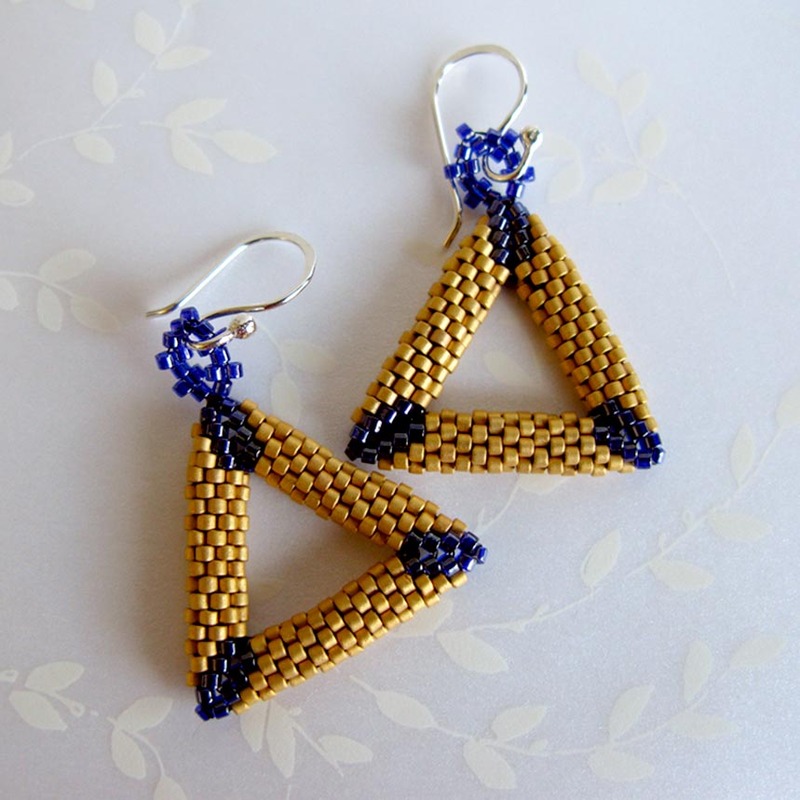 But I really like the very zen activity of bead weaving and I am going to just relax and see where it takes me.